...... EazyPaper knows all the picky formatting rules, so you don't have to. EazyPaper formats your papers perfectly! Get better grades with EazyPaper while saving time, money, and frustration. It's that simple! 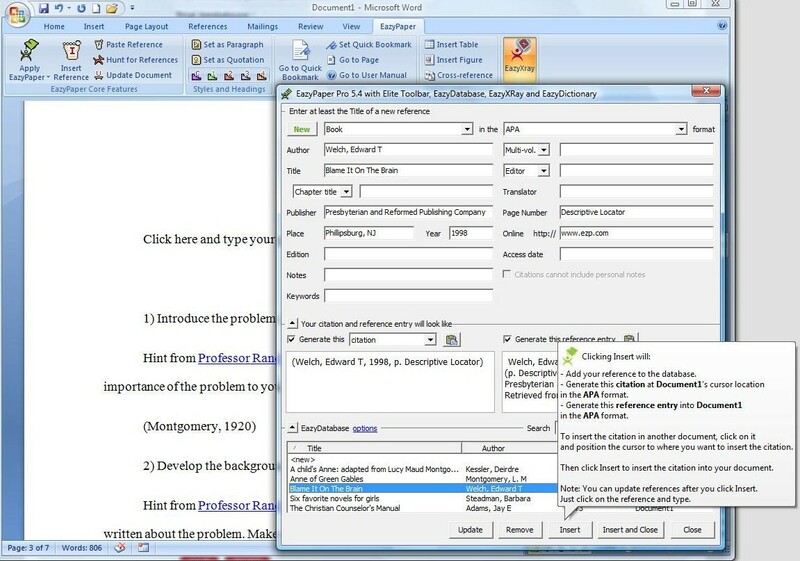 EazyPaper allows you to focus on writing your paper instead of understanding all the formatting requirements. When you're done, submit your paper to EazyEditing to be graded by a real Professor. Write the paper, not the footnotes. Download now! Qweas is providing links to EazyPaper 6.5.1 as a courtesy, and makes no representations regarding EazyPaper or any other applications or any information related thereto. Any questions, complaints or claims regarding this application EazyPaper 6.5.1 must be directed to the appropriate software vendor. You may click the publisher link of EazyPaper on the top of this page to get more details about the vendor.